The Gospels don't really tell us much about Mary beyond the fact that she was chosen above all women to be the mother of God. She must have acted much the way all good mothers do. Jesus was far from being a dutiful son and grew into a determined man, inflexible and uncompromising. But She had His ear and knew when to ask a favor. From an early time, the Church encouraged the devout to view Mary as their most powerful advocate when dealing with Christ the Judge. Tiziano Vecellio (Titian) is a great painter of children. Think of the six young faces looking out at us in Vendramin Family (National Gallery, London), or the young man on the right in the Pesaro Altarpiece in Venice. But they are always male children destined to grow up into power and privilege. 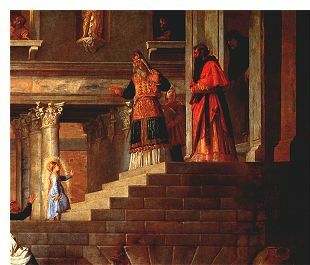 The Presentation of the Virgin is unique among his work and perhaps among Renaissance art. He portrays a very little Mary who is already dedicating her life to God, leaving her home and entering the Temple where she will pray and study for ten years. (Then, unexpectedly, the High Priest will tell her that she must marry.) The little girl's solitary walk up the massive staircase is memorable in itself, as well as being one of the few heroic images of a young female in all of Western painting.